I feel like shouting from the rooftops about how delicious these cookies are!! If you're a chocolate fan you will absolutely love these, and if you aren't, you'll love them anyway. I was looking for a recipe to make cookies with white chocolate chips when I came across this one from The Pioneer Woman. I wasn't thinking about chocolate batter, but when I found this recipe I knew I had to try it. It does call for white chocolate chips and regular chocolate chips, which ends up in so much yummy goodness. 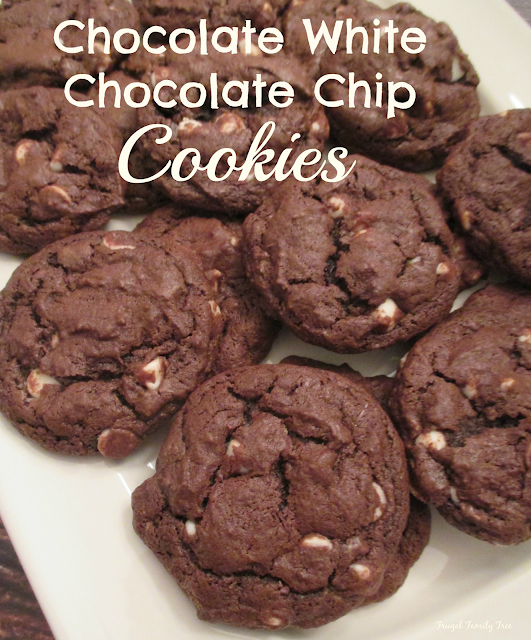 This recipe makes about three dozen cookies, and it's pretty easy to make. These cookies are perfect to share with friends or coworkers if you want them to think that you have mad skills in the kitchen. That is, if you can bear to part with them!! Stir together the flour, cocoa powder, baking soda and salt, and add in batches to the mixer, mixing until just combined after each addition. Gently fold in the white chocolate chips and chocolate chips. Using a cookie scoop, add 1 tablespoon portions to a baking sheet. Bake until the cookies are done but still soft and chewy, about 8-10 minutes.